This year Pantone announced it’s color of the year and I was elated. I grew up in a tropical climate and when I heard that Greenery was to be the color of choice for the new year, I hit the roof! While I’ve never explicitly expressed a love for green, I realized that it is, in all actuality, one of my favorite colors. Leafy greens are extremely versatile in home decor. They can add the perfect shot of color to a more neutral space or act as a base, when used in larger doses, to give other accent colors the room to shine. Of course one of the best ways to bring green into a space is with plants. Personally, I keep a lot of plants in my house (not always successfully) and I also have a number of green accents scattered throughout my space including a bowl of malachite beads and cushions in green, black and white. One of the most exciting things about this return to green is that it coincides with the return of one of my all time favorite patterns: the banana leaf print. If I haven’t mentioned it before (though I probably have), I grew up in Guyana surrounded by many different types of plants, flowers, birds and animals. Among so many other things, the experience has given me a love of all things tropical when it comes to interior decorating style. It’s also where I learned to love banana leaves, as our first house had a small sweet fig banana tree in the yard and I loved to eat from that tree. I remember the large leaves with torn edges cascading from the tree as my sisters and I shared the sweet fruit. I moved to New York over a decade ago and while, to this day, I’m not used to the cold climate, what I miss even more than my green Christmases are the banana leaves that used to decorate the outdoors. I was made for the tropics and and whenever I can bring a bit of those warm memories, as well as my culture with me to the concrete jungle of New York City, it’s a moment that makes me smile. So it’s no surprise that once I settled into my chilly new home, one of the first patterns I incorporated in my apartment was the banana leaf print. While my own love of the banana leaf is deeply rooted in my own story, the print is so much more than my preferred way to import tropical style to New York City. It’s a verifiable part of design history. The first banana leaf print was the original creation of none other than Dorothy Draper, the wealthy socialite and designer who became the godmother of all American interior designers when she opened the nation’s very first interior design studio, Dorothy Draper & Company, in 1923. She released the print in 1937 under the name, Brazilliance as part of her design for the Arrowhead Springs hotel in California. 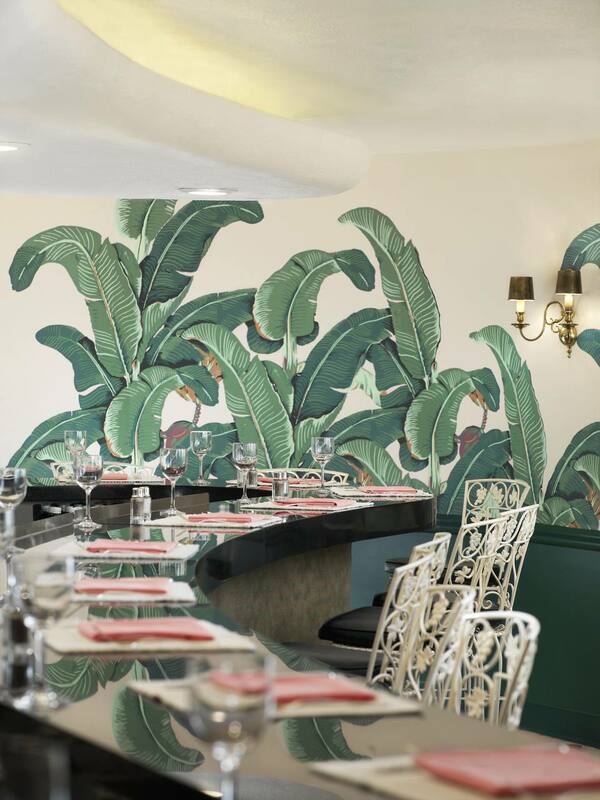 Just five years later, designer Don Loper released his own banana-leaf inspired offering titled, Martinique, for the Beverly Hills Hotel. From there the print became a mainstay of luxury hotels and restaurants across California and beyond. By the 70s it was nearly synonymous with Hollywood opulence, appearing as the backdrop in so many images of the biggest stars over several decades. Of course like every trend (and every plant) the banana leaf had it’s time in the sun and then faded gracefully from sight (aside from appearing on the TV series Golden Girls as a print in a bedroom set). But now the millennium has come and gone and, as the saying goes, everything old is new again. My obsession for banana leaf pints has only grown with time. Five years ago it led me to buy an 18 yard roll of fabric because inventory was low and I was afraid I’d never get my hands on it again. But now things have changed and this growing trend is everywhere I look. I even eat at restaurants that banana leaf wallpaper so I can enjoy the view. The best thing about this new resurgence of banana leaf prints is that it’s not just wallpaper anymore. I’ve seen clothing, coasters, shower curtains, quilts and trays all in this print (and have bought most of it). Modern decor is going tropical and I couldn’t be happier. So for everyone who’s just catching on the the phenomenon, we’ll take a look at 10 products that will help you put this lovely print to its best use in your home. Continue reading to see how you can add pantone’s color of the year and one of American design’s most iconic prints to your home all at the same time. Forget money, time is pretty with this stylish clock. Whether you’re looking for a tastefully minimalist way to bring a small pop of color, or for an adventurous way to throw an unexpected moment of pattern into your space, this clock is perfect for just about every need. Lots of white space and a warm, neutral outer ring let this piece boast a healthy number of banana leaves without being overwhelming. Tropical time is usually relaxed and slow, so be sure to keep your eye on this beauty so you won’t be late for work while sipping a Piña Colada at home. A beautiful evolution of the original banana leaf wallpaper. Layers of leaves criss-cross and overlap each other to create a calm and mesmerizing effect. The color is strong enough that these curtains can be the main color statement in a space with very little else to round out the story. This is a great way to add some tropical flair to any room with window treatments that take center stage. Throw pillows are the ultimate accessory for any room and the utmost necessity for every sofa and bed. They're perfect for experimenting with colors and patterns because they’re small, light, relatively inexpensive and easily replaced. So if you're not sure how far you want to take your love of banana leaf or Greenery, a throw pillow is a perfect way to dip a toe in the water without having to take the whole plunge. At the same time, you’ll be surprised how far a few pillows can go to change the look and feel of a room. So just mix a few of these into your bedroom or living room pillow rotation and see how much a pop of green can do to refresh any room. This fabulous, banana-leaf covered duvet is so amazing that it almost speaks for itself. Paired with pillows in banana-leaf and solid green, this bed becomes a colorful oasis in a room of black and white. How will you ever get out of bed? Art is one of the best ways to make a statement in your home. It fills what would otherwise be empty spaces on the wall and gives you all the room you need to express yourself. But if the space between neo-cubism and feminist dada readymades are waters that you’re not quite ready to navigate in your search for art to put on your walls, this beautiful banana leaf water color might be just the alternative you’ve been waiting for. It’s also the perfect choice for anyone who loves the iconic wallpaper but doesn’t want to cover an entire wall with the print. Personally, I love the look of this print and how the use of watercolors makes it subtle and bold all at once! If the tray has already caught your eye, why stop there? Impress your guests and enliven your space even further with a bit of coordination. These ceramic coasters, featuring another banana leaf print are as beautiful as the tray and can be every bit as useful. Keep them out as part of your standing decor to help tie the eye-catching green into the larger color story of the room or keep them hidden until it’s time to serve a conspicuously on-trend round of refreshments. As wonderful as it is to have so many pieces of home decor sporting the banana leaf motif, there’s just nothing better than a classic. Unless of course, it’s a classic with a new twist. One of the best things that technology has done for renters in the last few decades is the massive leap forward that we’ve had in the quality of removable wallpapers. And now a pattern that was once reserved strictly for Hollywood A-listers is adorning the walls of apartments and dorm rooms everywhere. Another evolution of the wall-decorating original, this beautiful shower curtain boasts an oversized version of the print, paired with the color of the moment, millennial pink. Now you can give your powder room the same glamorous look as the best clubs, restaurants and hotels of Hollywood’s golden age. What could be better than that? Equal parts storage and decoration, trays are one of the most versatile items you can have i your home. Liven up your next tea service, give a tropical, resort-style feeling to breakfast in bed, or add a splash of color to your entryway with a prettily patterned catch-all. The possibilities are limitless and with the gorgeous dark shades of green that bring so much personality to this tray, whatever you do is sure to look amazing. In the end, there’s just no better way to bring the banana leaf vibe into your place than with the real thing. It’s the ultimate way to incorporate greenery into your space. These oversized plants make an immediate and dramatic statement in any room. So if you’ve got a blank spot in a room and you just don't know how to fill it think about grabbing one of these plants. You’ll be glad that you did.